EnviroDevelopment is a nationally recognised certification and branding system providing independent verification of a development project’s sustainability performance. Certification recognises projects that achieve exceptional sustainability outcomes whilst also providing an edge for developers looking to differentiate their project. EnviroDevelopment has been guiding and certifying development projects for over 10 years – with more than 125 projects certified across Australia. With the appetite for incorporating innovative and sustainable features growing, we are seeing a record number of developers applying for certification. Development projects can seek certification in up to six elements, also known as ‘leaves’, including Ecosystems, Waste, Energy, Materials, Water and Community. 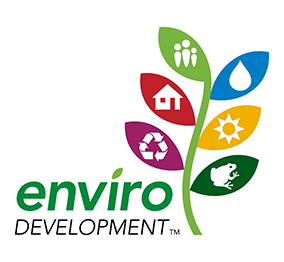 When purchasers see the EnviroDevelopment logo, they are assured the project is an industry leader. The logo system empowers purchasers to make informed decisions on whether a development offers the features they value and have aspiration for, particularly as EnviroDevelopment provides a framework to clearly articulate consumer benefits. In addition to accessing an effective communication tool to help inform consumers and tenants of the innovative and sustainable initiatives of the development; Certification provides a third party verification for external stakeholders whilst the EnviroDevelopment Standards provide an opportunity to measure a project’s performance. In WA, EnviroDevelopment’s are also recognised under the Water Corporation’s highly regarded Waterwise brand. A well-established partnership between the organisations provides great benefit to developers with an automatic pathway to project endorsement as a Waterwise Development. A Waterwise Development is recognised as delivering exceptional water efficiency outcomes as a water sensitive development. EnviroDevelopment’s that achieve a Water leaf certification are eligible to join this program with all the benefits associated with recognition. The Waterwise logo is a well-known and regarded achievement amongst consumers and within industry and government.